"Turbocharger cores corroded, and Bank 2 turbo has small hole in the core and bank 2 actuator rod broken after wastegate – Not causing an issue at the moment, but be aware that the car will require a turbo refresh in the future – To give you an idea of cost involved - To remove the turbos, fully refurbish, and refit with all new oil lines, check valves and heatsheilds is £4400+VAT"
There is no performance issue at present as the car still goes like a scolded cat!! Just wondered if anyone has any thoughts on this before I go ahead and bite the bullet? As the actuator rod is broken. Are you receiving less boost? [quote="P911X50"]As the actuator rod is broken. Are you receiving less boost? [/quoten] No issues with boost level! Sounds like they will send them away to be refurbished. Cost of new Turbos will be considerably more. Its probably something you are going to have to bite the bullet on. If it was not for corrosion, there is a cheap workaround on broken actuator arm by welding it. But as you're into new Turbos probably go for 2x turbo refurb and the ancillaries quoted. Phone - AET Turbo or Universal Turbo these are both renowned turbo builders who regularly feature on Car SOS and Wheeler Dealers. You'll be surprised by how inexpensive it is to have a set of K16 turbo's rebuilt back to OEM standard. Hybrid builds are a different story of expense..
Now, the remainder of that fee will be placed on labour of removing and replacing the 12 bolts (6 for each turbo) from the car. The garage will probably say that the bolts will be corroded on (and they probably will be) and that what takes most of the remaining £3980 inc vat in labour to remove and replace those turbos. There's is a lot of smoke and mirrors in the Porsche Indie world so just be sure you are clear and what job you are paying for. If you have anymore questions feel free to PM me. Alternatively Im happy to have an open conversation on here if it benefits others. Here is what I want you to do OP. Phone - AET turbo's or Universal Turbo these are both renowned turbo builders who regularly feature on Car SOS and Wheeler Dealers. You'll probably be surprised by how inexpensive it is to have a set of K16 turbo's rebuilt back to OEM standard. Hybrid builds are a different story of expense.. The garage will probably say that the bolts will be corroded on (and they probably will be) and that what takes the extra £3400 labour to remove and replace those turbos. There's is a lot of smoke and mirrors in the Porsche Independent world so please ensure you are clear and understand exactly what job you are paying for. There is no smoke or mirrors in the Indy work Simon, just a proper way of doing it. So you think £3400 in labour - really ? £400 for each turbo refurb? I have yet to have any turbo refurbed back to new for even close to that - remind me how much a set of actuators are from Porsche ? Iirc they are £310 each, oil lines, vent lines , check valves , catch can are about £460 on each side alone never mind the turbos themselves. When you replace a turbo you always replace all the lines because they are full of carbon deposits - seen a new turbo blow in 2 minutes at another independent who ignored my advice and tried to do it on the cheap. You leave those deposits in the lines and you reduce the life of the turbos. As to 6 bolts - any decent place is removing the manifolds and replacing all the bolts at the same time. Then boost leak, datalogging and testing after installation. It is what Porsche do when they resolve except they charge £9200 plus vat and we charge £4400 plus vat. There is a cheap way and a proper way. Well said Ken! The last sentence says it all. Before I found my car I test drove a black 996T in North London that pulled like an absolute lunatic. It was re-mapped to some degree. Back at the chaps works car park I pulled my overalls and jack out of my boot to have a nosey underneath , I found the N/S actuator rod snapped, so the car was still pulling very well, albeit stressing one turbo to death whilst the other did no graft whatsoever. Very surprised to say the least, so was the seller. Goes without saying, I don't own a black car. '02 996 Turbo Manual Coupe Lapis/Grey. Unlimited grins. In the interest of diplomacy I won't be commenting on the other points you made either I'm afraid. It may be worth mentioning that the opinions I've given is not individual but a shared one. GNot looking to stir things , just had quick look at AET site, service exchange K24 turbo, £795 each presume + vat. So as 9e says with all the other ancillary parts and labour and vat your gonna struggle for a' cheap' job! assuming they are needed. 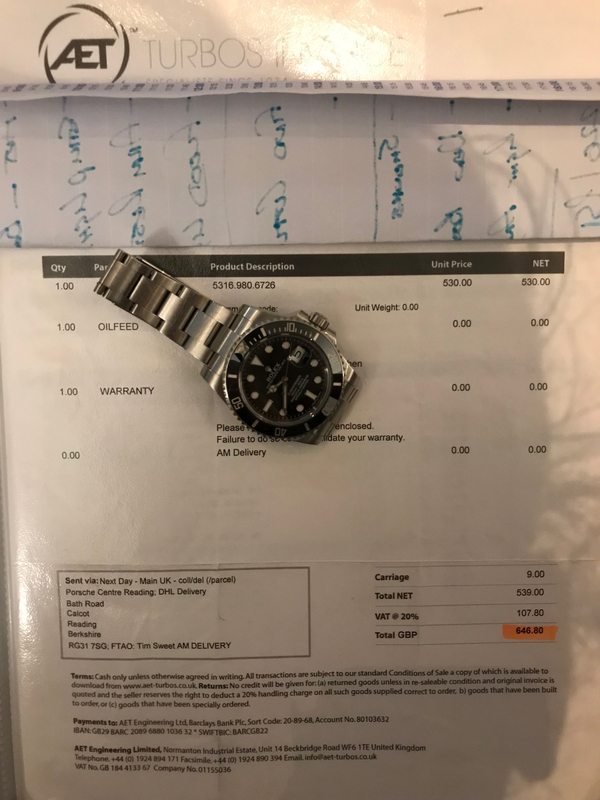 why is the watch bracelet covering the part description? Thanks for all the nice pm's guys. For the few that asked, the labour work was commenced at Porsche's Head Office hence why the return/send address is Porsche RG (good eye!). Conclusively, there is a cost effective way that is proper which includes being advised by Porsches Workshop Manager and Head Technician every step of the way. They actually have a department dedicated to the older car not under warranty. In this department the labour price is deliberately lower for cars 10+ year old (please correct me on this as this is an approx) to £105 per hour inc vat iirc. Usually its something ridiculous like £185 plus vat. Why don’t you put up the whole job showing all the parts and labour so everyone can you what you have had done. Then I will do the same - you only need to show one turbo. And I thought the oil industry took the piss.........no offence Ken as I realise these are Porsche prices. My objective in this thread is to share information for the best interest of a other Porsche owners in an as unbiased manner as possible. -Not to turn threads into a versus match or argument. -Not to defame an individual(s) or company (s). Unfortunately, you have put yourself and your company in a difficult position by taking ownership of the quote that the initial user posted of which no names were mentioned initially. If people are motivated they will simply contact both companies for comparative quotes. These platforms are for helping everyone out. My advice to you would be to alter your initial post and take down the accountability of the thread starters quote. I’d also recommend removing the indirect pun about my approach that was facilitated by Porsche Head office taken being cheap and not ‘proper’. The facts are that the quote from the OP was text copied from an email from 9e to the OP. You have then deduced ( how we would all like to know ) that the Labour was close to £4k, that ( and quite rightly the OP ) should shop around because of the labour. Unfortunately as has been shown by our internal document, the labour is not £4K. The problem Simon is the OP may based on your comment believe we are ripping them off. I am entitled to defend 9e. You then say that you don’t want to argue, not your intention to deflame etc and yet in the next sentence say you wont put up as you don’t want to embarrass us ? So you are still trying to make a point that we are not providing a good price. So you have the list , you have the labour and what is changed. So unless you are paying less than £80 plus vat per hour , or you are not doing xyz as detailed in the labour, the only difference in price will be if the turbo refurb is cheaper. The point of the forum is to help others and make them informed. Your saying £2200 plus vat is a rip off for one turbo refurb. Your saying that Porsche OPC will do it cheaper. Well show us how that is please and if you can then I will be happy to adjust my pricing. I am not taking any post down Simon. My post stands.